The mountainous area of Norway called 'Jotunheimen' is named after the frost giants (Jotunns) of Norse mythology, aptly so as it encompasses the 23 highest mountains in Norway. I spent a week based at Spiterstulen, bagging peaks around the valley, before I spent two days hiking to the other end of Jotunheimen, Turtagrø. 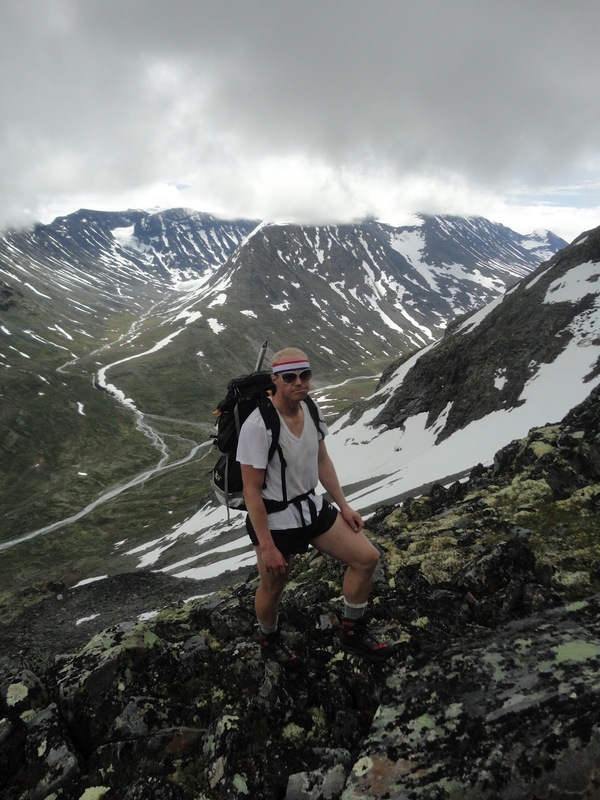 The icing on this 10 day cake of hiking was a climb up Store Skagastølstind, Norway's third largest peak. Each colored line represents a day hike. Red is day 1, orange day 2, etc. 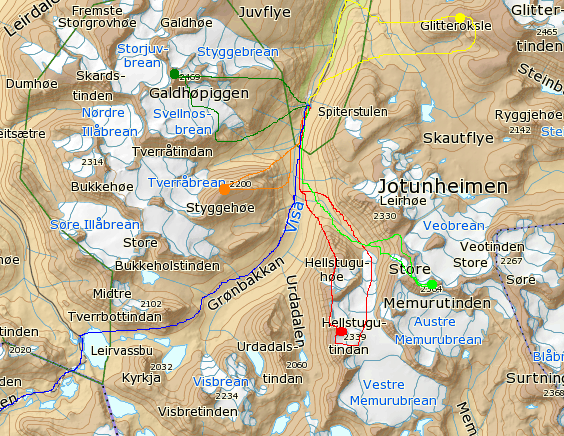 The blue line is the beginning of my through hike to Turtrgrø later in the week. The colored dots are the highest peak of each day. Traverses are fun - they're more exciting than just hiking up a mountain, and often require scrambling. Zoe, my younger sister was along for this one, and she did great despite her fear of heights. Unfortunately, and this will be a reoccurring theme of the next 10 days, the weather wasn't great. In fact, we were in the fog all day. At least it mostly didn't rain! The ridge was beautiful, but I feel like I have to go back and do it again to actually enjoy what I know is a breathtaking view. One section required you to edge along a ledge. Although the fog made the size of the drop on your left side hard to judge, it was far enough to make you very careful. After ascending three 2000 meter peaks - Hellstuguhø, Nørdre Hellstugutind and Midtre Hellstugutind we dropped of the ridge on to the glacier and hike out. Despite a dismal weather forecast, a hopeful group started up Styggehø, one of the most accessible peaks from Spiterstulen, in the sunshine. Soon our shirts came off... The beginning of the Hellstugu ridge can be see in the upper right corner of the picture. 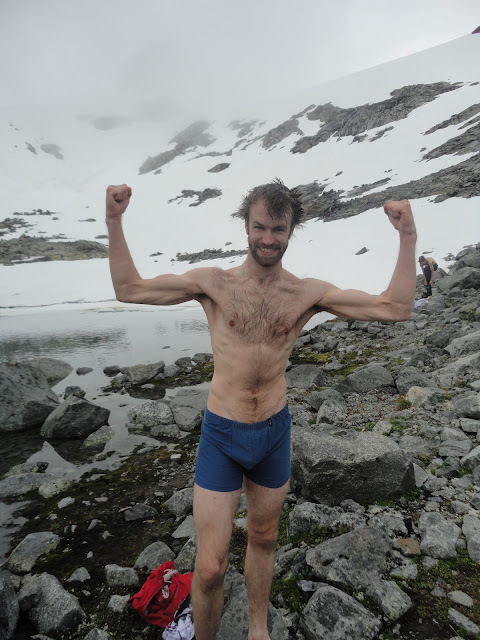 Later, to guide Hågen's dismay, it clouded over and shirts went back on. Then I took a day of to rest my legs that had now climbed in excess of 2400 meters in two days, to return my sister to civilization, buy more food and pick up the Man Unit. Since he only had a 5 day vacation, we had to cram in as much hiking as possible - no more rest days! 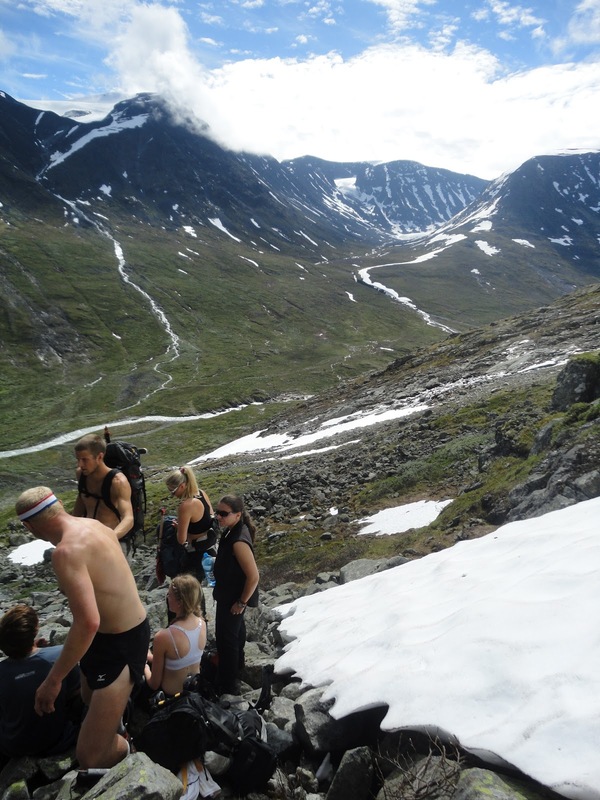 We joined a group of friends up the trail to Norway's second largest mountain, Glittertind, but diverged from the beaten path and ended up on Vestre Glittertindoklse, a subtop on the same ridge as Glittertind. After a relatively easy day on Glittertindoksla, we joined a group going up Norway's eighth highest mountain via a steep glacier - funfunfun! The group heads up the valley to Djevelbreen(Devil's glacier). The day again started nice by clouded over and started raining as sound as we sat down to eat lunch. Good way to keep your breaks short. 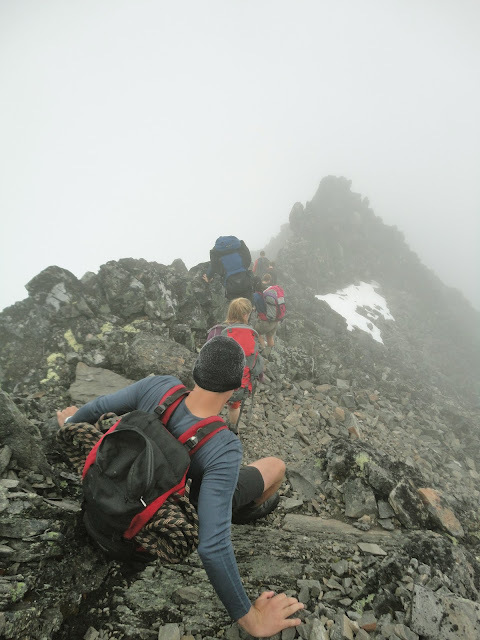 We headed up the glacier and then steeply up a loose, rocky slope to the summit ridgeline. 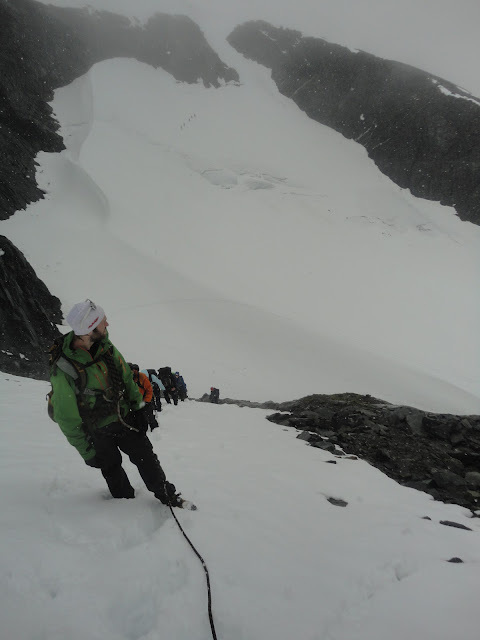 The Man Unit, attached to me and 3 others by a rope, looks down the glacier we just came. In the distance, on the other side of the glacier valley, you can just see another group headed up the snow field on the other side. They took a slightly different route to the same top. The reached the summit in the clouds. It was a fun hike, but I was still disappointed not to get the spectacular view I know is out there somewhere! The climb up Galdhøpiggen, Norway's highest mountain, is usually undertaken on a well-trodden footpath known as 'the Highway' to some. We choose a more interesting route, joining a group headed across magnificent Svellnosbreen on the way up. 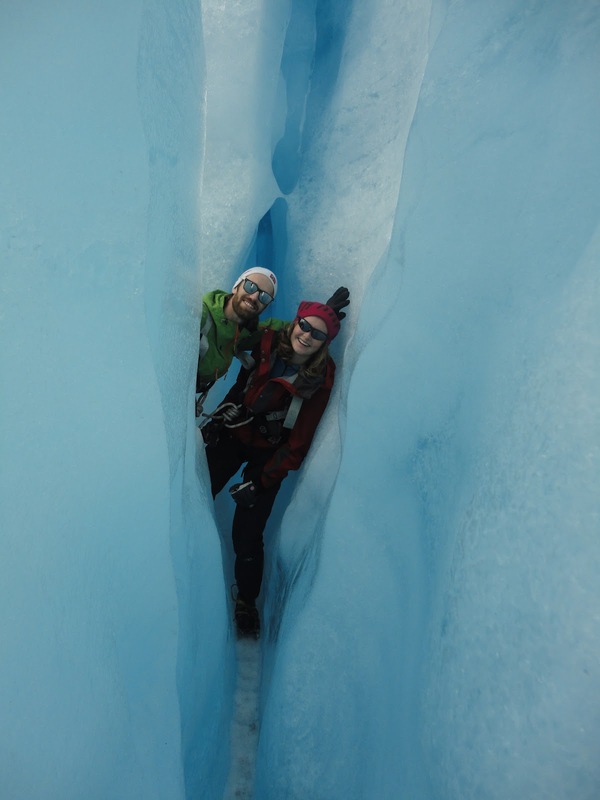 A hard, two-hour hike of 600 vertical meters takes you to the mouth of the glacier, where it is of course obligatory to bath before donning crampons and a harness. Then into the crazy glacier world! Mirrored sunglasses are fun to take pictures of! You can see the rest of our group in the glasses. Ranuculus glacialis, one of the highest growing species of flowers, on the steep slope up to the summit ridge line. Svellnos glacier and the Tverråtind ridge can be seen in the background.